We have been able to earn a stupendous market reputation by manufacturing, wholesaling, retailing and supplying a great range of Handmade Gift Packaging Bag. The offered bag is precisely designed by our nimble team of professionals using premium grade fabric and ultra-modern techniques. Provided gift bag is widely acclaimed in the market, owing to its elegant design and vintage styled patterns. Furthermore, our prestigious clients can purchase this gift bag from us at budget-friendly rates. 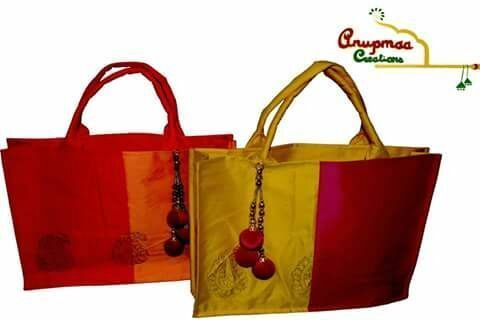 Incepted in the year 2010, in Jaipur (Rajasthan, India), we “Anupmaa Creations” are the reckoned manufacturer and supplier of an enhanced quality Gift Pouch, Handmade Gift Bag, Handmade Envelope, Jewellery Kit And Pouch, Chowki Cover, etc. We have built vast business empires based on the principle of sole proprietorship. The offered products are designed by making use of supreme grade paper and other material with the help of ultra-modern machines in compliance with set industry norms. These products are widely used for packing gift items and decorating purpose in different places. Our offered products are made available in different specifications for our clients to choose from. Further, these products are checked for their quality on series of quality parameters before being supplied to our clients assuring their flawlessness at user’s end. The offered products are widely appreciated by our clients for their number of features such as light weight, tear resistance, attractive design, moist proof and durability.